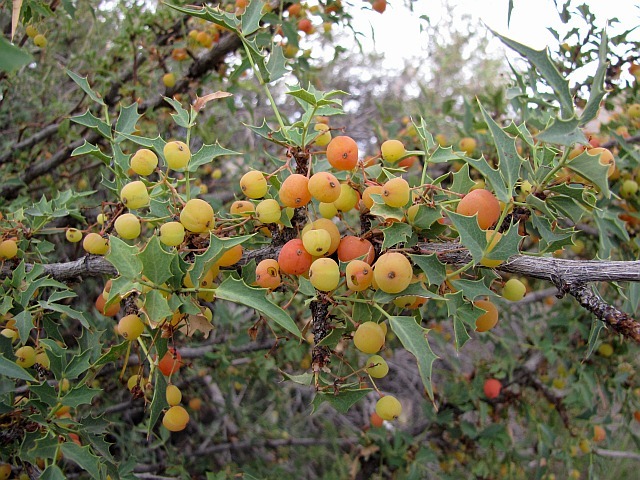 The Desert Hollygrape is also known as Oregon Grape, Fremont's Barberry and Algerita. 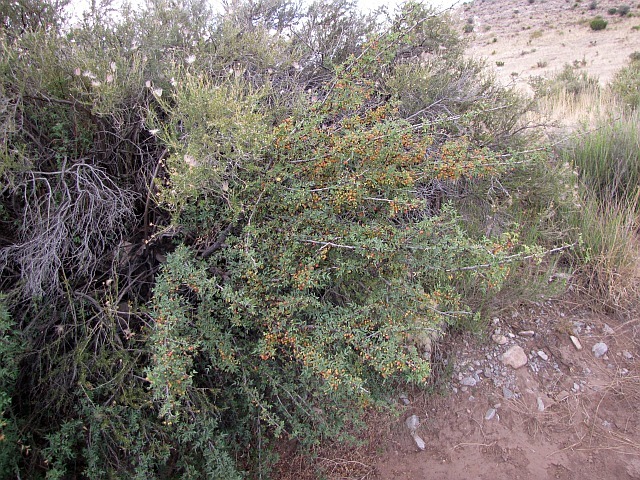 This shrub is mainly found throughtout upper Sonoran, Desert Grasslands, Chaparral-Scrub and Juniper-Oak regions. The leaves are tooth-shaped with spikes on the ends. The leaves have a bluish tint and the inner bark is a distinctive yellow. 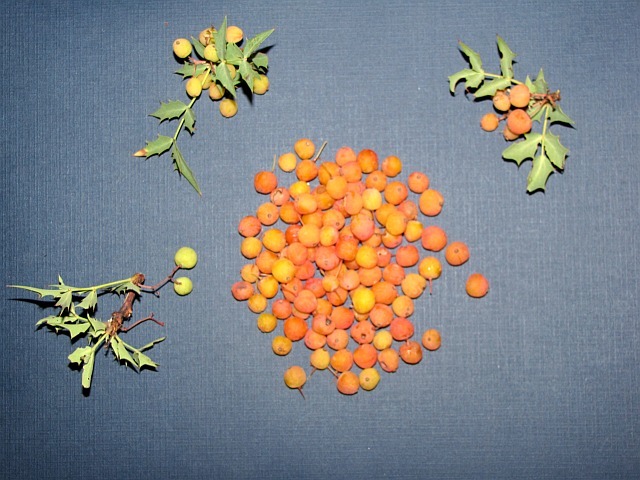 The berries can come in different colors; purple, red, yellowish-orange and sand color. The berries can be eaten raw, dried for later, made into wine, jams or jellies. The berries have a sweetish tart refreshing taste and is rich in vitamin C. To make a refreshing beverage, boil one to two handfuls of the berries in water. The roots of this shrub has medicinal value as well. The root has antimicrobial properties due to containing an alkaloid called berberine. A tincture can be made of 1:5 ratio with 50% alcohol. Approximately 10 drops of this solution taken before eating will assist the digestive system. To aid in the functions of the galbladder and liver, 15-30 drops of this tincture can be taken. Use the bark from the lower part of the plant to make a good antimicrobial skin wash. Just crush the bark and let seep in cool water. A tea can be made from the bark, as well, to make help with blood sugar problems. Wait a couple of weeks before taking more dosages of this plant. The Berbarine alkaloid has been shown to kill giardia. This makes for a good water purification treatment when in a survival emergency. The yellow inner bark was used by the natives and pioneers to make a yellow dye for dying bucking skin hides. Do not over look the variety of plant life that may be around you that can be used for food and medicine. This is why I always say Stay Prepared, Stay Alive. Learn the different plants that are in your area, as well as the area you are traveling to. 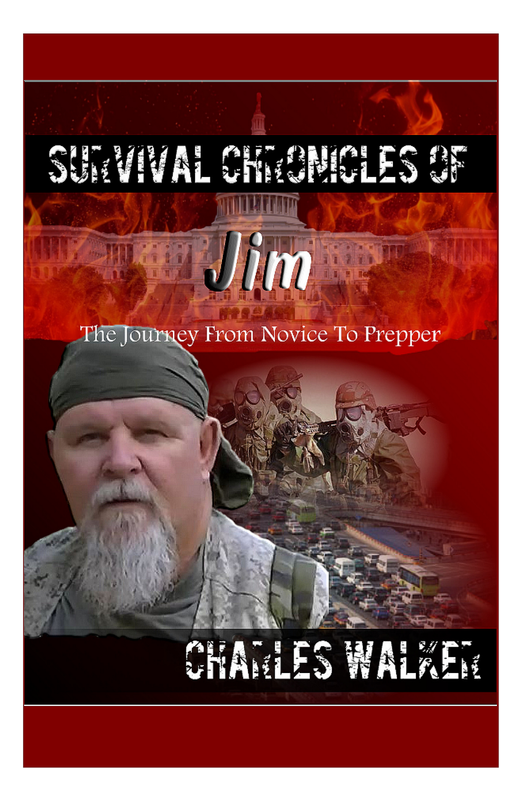 You may need this information and knowledge in a survival situation.